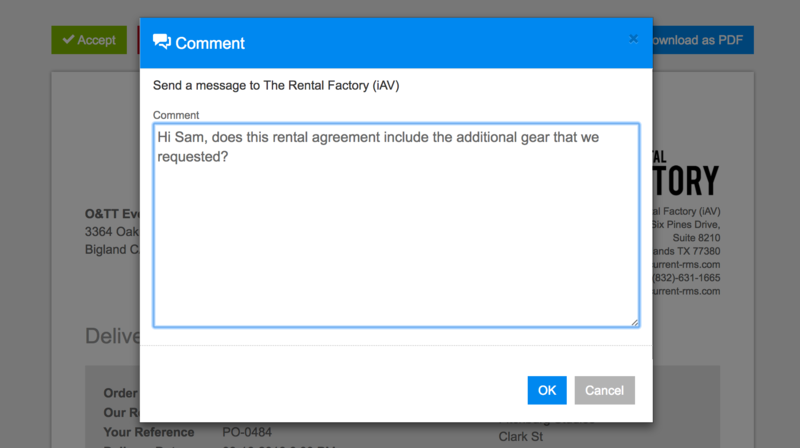 Document approval lets you set up quotations, rental agreements, delivery notes, and other opportunity documents with buttons to accept, decline, and comment. 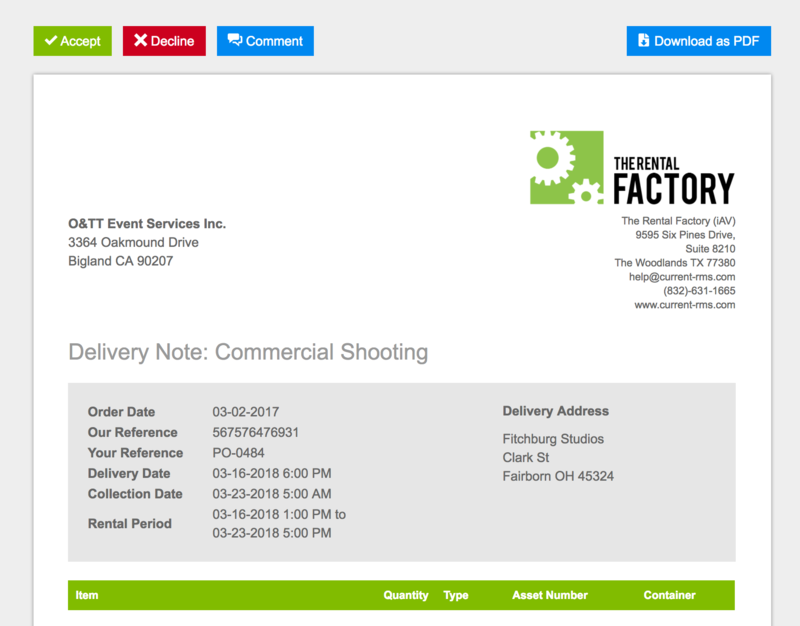 Documents can be sent out of the system via email for your customer to accept or can be viewed & accepted on screen – perfect for capturing proof of delivery on-site. Track how many times a document has been viewed and when it was last viewed. 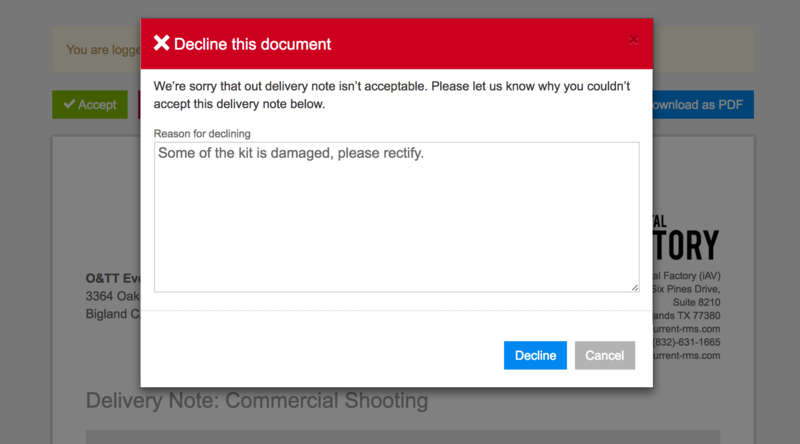 Receive feedback from your customer they decline a document. 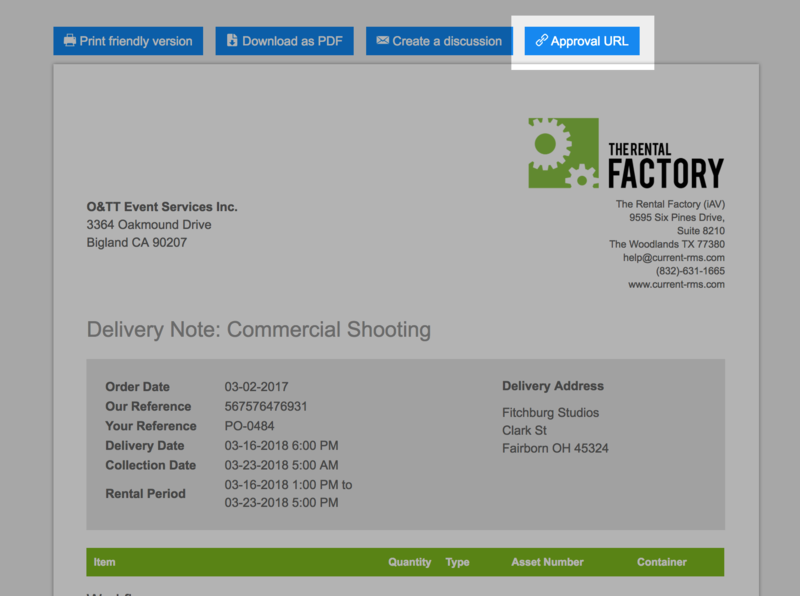 Create an approval form on the acceptance screen to gather additional information from your customer. Capture a drawn signature as part of the approval process. The signature capture in Current RMS is primarily designed for capturing proof of delivery or collection. You can use it for signing quotations and rental agreements, but keep in mind that the signatures captured are not legally binding. 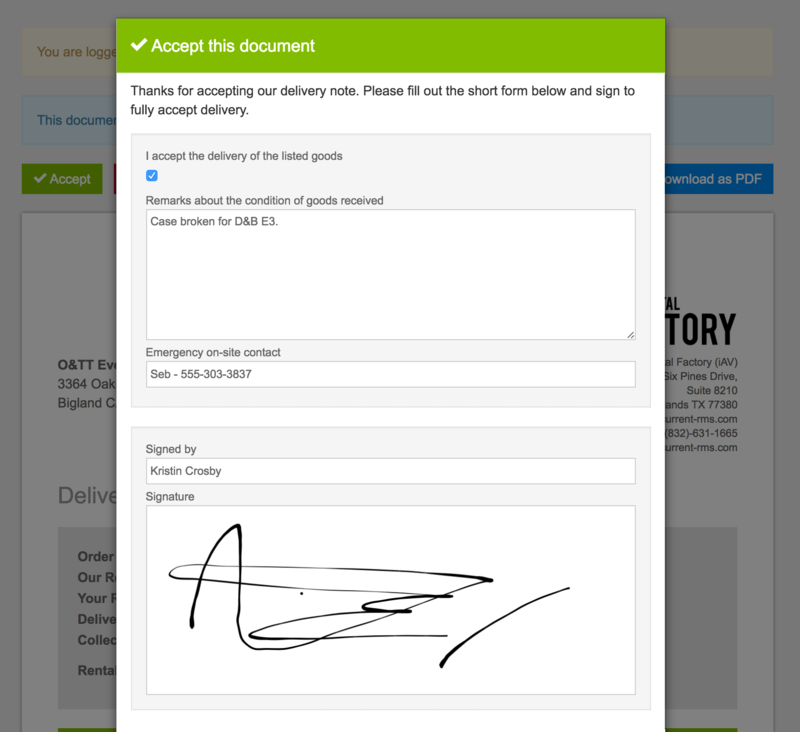 If you need to capture legally binding signatures, we offer an integration with Adobe Sign. From an opportunity, click the document that you’d like to send for approval under the “Print” heading on the right. Click the blue Approval URL button at the top to bring up the approval link. Click the link to access the document approval screen or select it to copy & paste into another application. Rather than copying & pasting the link to an email, send a link straight out of Current RMS by creating a discussion. 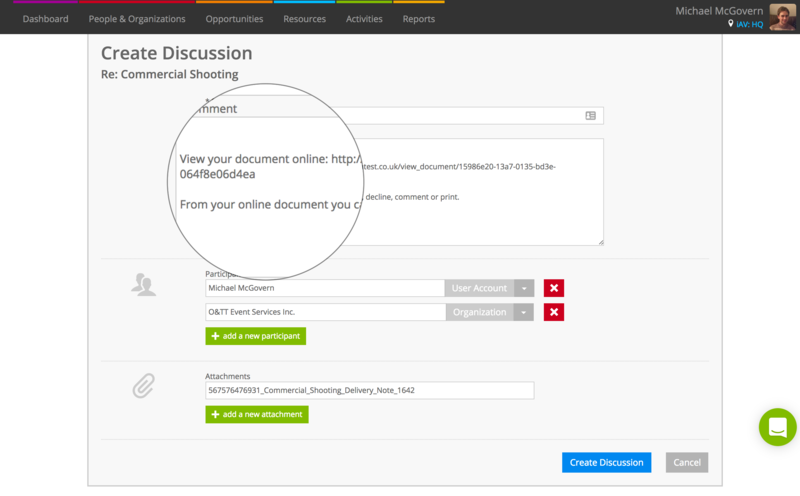 Just click the Create a discussion button from the document preview screen; the link should be automatically included, depending on the discussion templates you have configured. Use the green Accept and red Decline button at the top of your screen to accept or decline a document. When you or your client declines a document, there’s a field to provide a reason for declining. This is great for quotations – your customer can give you some insight as to why a quotation wasn’t acceptable so you can make changes. The Comment button doesn’t appear if you view the document while logged in to Current. It provides your customer with a space to message you about the quotation. When your customer comments, it creates a discussion against the opportunity with user participants of the opportunity and the organization. When accepting a document, you or your client will see your approval form and signature pad, if these have been configured against the document. 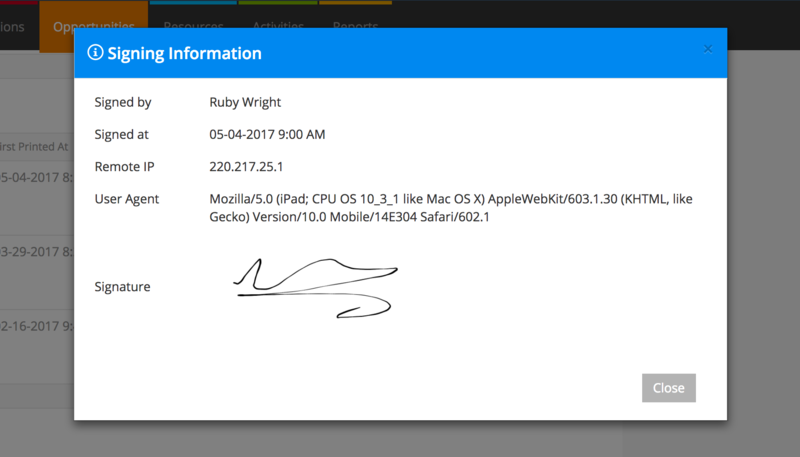 To sign, simply use your mouse or finger to draw in to signature box. You’ll need to enter both a signature and a name in the “Signed by” field to proceed. When you’re done, click Accept. The signature is stored against the document and a PDF copy of the signed document is attached to a discussion that is set to the customer and all user participants on the opportunity. As soon as you’ve sent or viewed documents for approval, they’ll appear under the “Approval Documents” heading. For each document, you can see when it was first viewed, how many times it was viewed, and when it was last viewed. The “view count” and “last viewed at” attributes aren’t updated if you view the document as a signed in user, only signed out views are counted to give you an accurate reflection of how many times a customer has seen a document. Where documents are open (i.e. not yet accepted or declined), you’ll see a pencil icon – click to jump straight to the document approval page. When a document is accepted or declined, you’ll see the date and the status. If a document is accepted, you’ll see an information icon. Click this to view signing information. The name entered in the “Signed by” field. An remote IP address uniquely identifies a computer or computers on a network. Current records the IP address of the device that the document was accepted on for your reference. A user agent is some text that’s sent by your web browser to web servers. It describes the operating system and browser. Current records the user agent of the device that the document was accepted on for your reference. A picture of the signature that was captured. If you make a material change the opportunity and print a copy of a document that you’ve already generated for approval, this new document will supersede the old one. This means that you’ll see the new version in the “Approval Documents” section with a status of open and your customer will be able to accept or decline the new version. If the customer uses the link to the previous document, they’ll see a message letting them know there’s a new version of the document. To access to the old version of the document, click Recent documents under Actions. Find your old version in the list and hit Re-Print. Why don’t I see the comment button? The comment button doesn’t appear if you’re viewing the approval link and you’re logged in to Current RMS. Log out of Current RMS or open an incognito window.